You spend alot of energy and thought in making just the right choices for what matting and frame will compliment your artwork. Choosing the right title plate for your artwork is just as important. Many times the common brass nameplates on frames compete with the frame, or even your art. As the shiny finish attracts the human eye away from the real subject matter -- your artwork. Midnight Thinkings makes a variety of alternatives available to you with both ornate or classic Art Name Plates. Brushed Gold/black lettering Paper-thin 0.004" and 1/32"
Brushed Silver/black lettering Paper-thin 0.004" and 1/32"
All of our Art Name Plates come with peel-n-stick permanent adhesive backing (unless otherwise noted) that is archivally safe. Allowing the plate to be attached directly to a frame, or even on the matte under glass (.004" and 1/32" materials). 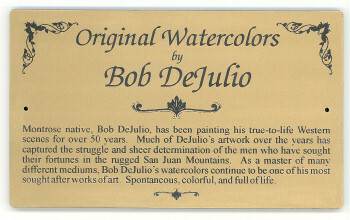 The example shown on this page (click photo above to see larger image) shows how Art Nameplate Style #1 appears in natural Finland Birch wood with type laser engraved in Daniela font. We will size the text and each line to what we believe looks best. But you can always add a comment in the order form at checkout if you have a special preference. Simply select the appropriate options from the choices below and tell us what you'd like engraved on your Art Nameplate. It's just that easy! This product was added to our catalog on Monday 07 October, 2002.